I understand wedding is supposed to be all over you, but bridesmaids are supposed to look beautiful too, aren’t they? So, don’t make them wear ugly dresses of the same design they would probably hate. Let them enjoy their roles of maids of honors wearing nice-looking gowns. First of all, avoid dressing your maids in dresses that will definitely look ridiculous and sexless like puffy-sleeved, satin-and-lace dresses in toxic color gamma. Try to remember that these are your best friends and sisters that are going to wear them standing by your side on your wedding day, moreover they ar the ones who will be paying for the dresses and they would probably want to wear their outfits once again. So, I am presenting you the dos and don’ts to follow while choosing the dresses for your bridesmaids. Don’t try to follow the latest trends in picking gown design since women are all different and thus these ultra-trendy dresses will unlikely look equally well on every single maid of honor. 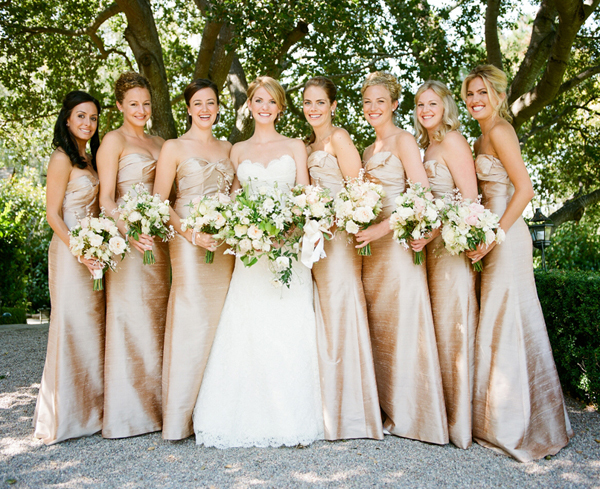 Do look for a style and color that will suit every size and skin tone of your bridesmaids. Do try to keep the price affordable to every single maid. $200 is an average price for a bridesmaid dress, but lower price is even better. Do keep in mind it is permissible for your bridesmaids to wear outfits of their own choice. Of course, you will be losing the uniformity, but they will definitely feel themselves comfortable and happy. Another variation is wearing their own dresses of one color. Do consider that the dress length is also important: formal and semiformal ceremonies require long or semi-long dresses. As for informal and daytime weddings, dresses of maids of honors might be of the same length as bride’s one, maybe shorter or longer. Don’t ignore the body types of your maids since one might be voluptuous, another one with a model body. So, you cannot put the same skin-tight or cleavage-revealing dresses on every single one bridesmaid. Very few body types would be flattered by a dress of the contrasting color with thousands of frills. Keep it simple to elegant designs, which are flattering to almost every female figure. Do avoid such colors as seafoam green and bright pink. Of course, I understand these could be the main colors of your wedding, but you would wrap yourself in such a dress? Besides, as I said before, they won’t fit women with different hair, skin and eyes color. Thus opt for the neutral colors, which are always good for formal weddings.